Could this be the cheapest product that Green Roads have released onto the market? Well, its cost says it all. You can buy Green Roads Daily Dose Pineapple Express CBD Terps to keep you feeling relieved of your symptoms all day long. • It is made with pure CBD oil. • It’s blended with a range of pineapple terpenes. • It contains some floral flavor from the glycerin. • Usually causes a powerful entourage effect. • It has a sweet and smooth flavor. • Chronic pain: You can reduce the pains in your body by having this product in your cabinet. No more pains. • Severe headaches: Although headaches seem to be common to everyone, there are severe headaches called migraines. If these are not treated, you can suffer other consequences. But the good news is that you have Daily Dose Pineapple Express to give you relief. • Depression: You can now avoid the depression that is making your life dull. All you need is to have this product; slowly you will realize just how much your depression has improved. • Anxiety and stress: These two symptoms are the foundations of having depression. If you can counter them, you can guarantee that depression will not befall you. Avoid or reduce stress and anxiety levels by taking Daily Dose Pineapple Express. • Fatigue: Sometimes your busy schedule can make you feel exhausted and fatigued, especially later on in the day. 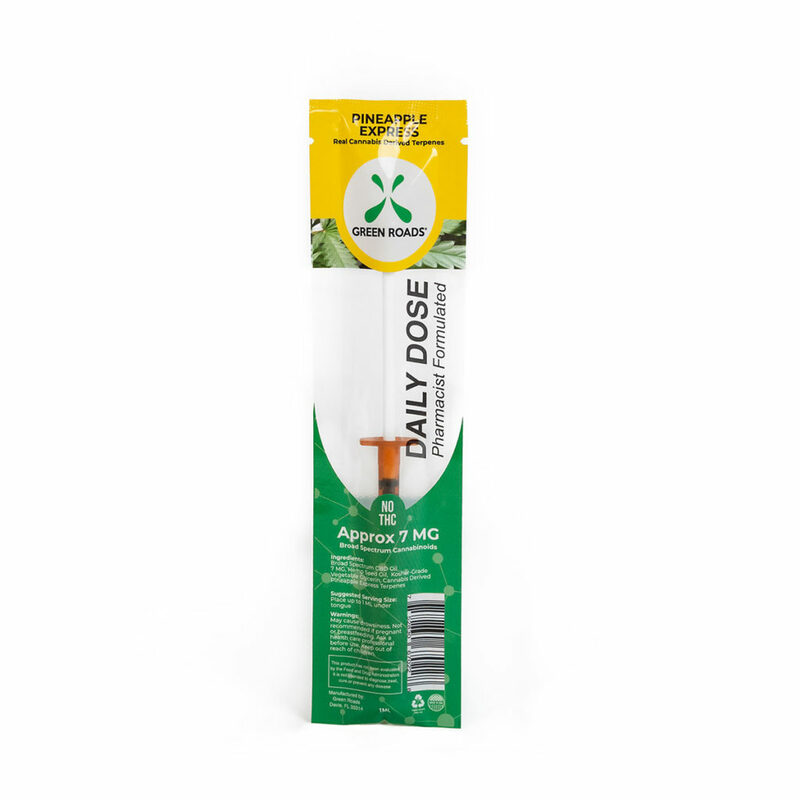 This Daily Dose is a perfect reliever that will ensure you get the relaxation that you’re missing. Quality: Green Roads never distributes its products into the market without testing them in the lab. It is then approved by pharmacists who have more than 20 years of experience. Having been made naturally without adding other artificial preservatives, it has been tested for quality assurance to ensure it is safe for your use. Effect: This product, which is extracted from the hemp plant, has a serving size of 1 syringe where every syringe contains around 7 mg of CBD. It can be very effective depending on your individual needs. This means you don’t see your friend take a certain dose and you follow suit, as it might not work for you. It has been proven to reduce stress, anxiety, fatigue, inflammation pains, and other chronic pains. If you are not used to CBD, then Daily Dose Pineapple Express is a great product to start with. Price: No matter how much you earn, you don’t have a reason to continue struggling with pains, headaches, and fatigue during your busy day. You only need $ 6.99 to smile again in life. You don’t have to go to do some market mapping to get the product; you just need to click on https://hempworldstore.com/green-roads-cbd-oil-product-review-10-coupon/ to buy Daily Dose Pineapple Express CBD Terps online. Final Thoughts: Daily Dose Pineapple Express is the best product that provides relief, even in for the busiest of people. It is made with pure CBD oil. It’s blended with a range of pineapple terpenes. It has a great pineapple flavor. It is very effective in giving quick relief. Pregnant women should consult a physician before using it.